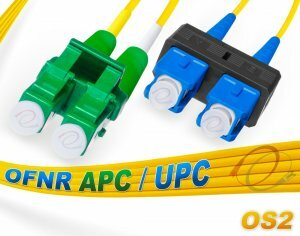 OS2 LC-APC / SC-UPC Duplex Fiber Patch Cables 9/125 Singlemode Jumper. 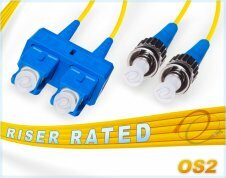 OS2 LC/APC to SC/UPC Duplex Fiber Patch Cable, TAA Compliant, Corning 9/125 Singlemode Jumper Cord. Manufactured in the USA with the highest standards and quality. 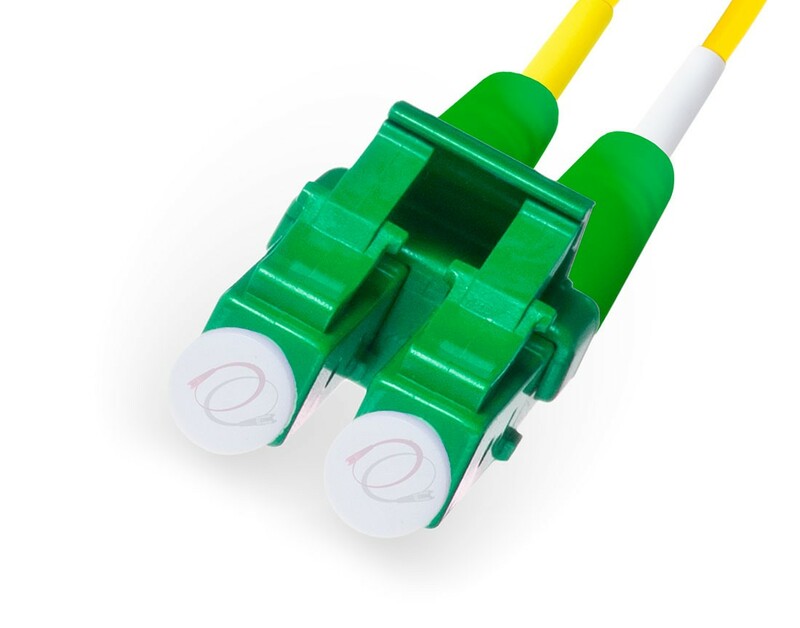 Corning optical fiber glass 9/125 core, terminated with 1.25m ceramic ferrule LC/APC & SC/UPC polished connectors with Duplex clips. Yellow OFNR PVC 2mm diameter jacketed, Single Mode Fiber, Zip-cord, TAA fiber optic patch cables. Connector 1 LC (APC) Duplex Termination, 1.25mm small form factor ceramic ferrule. Connector 2 SC (UPC) Duplex Termination, 2.5mm form factor ceramic ferrule. 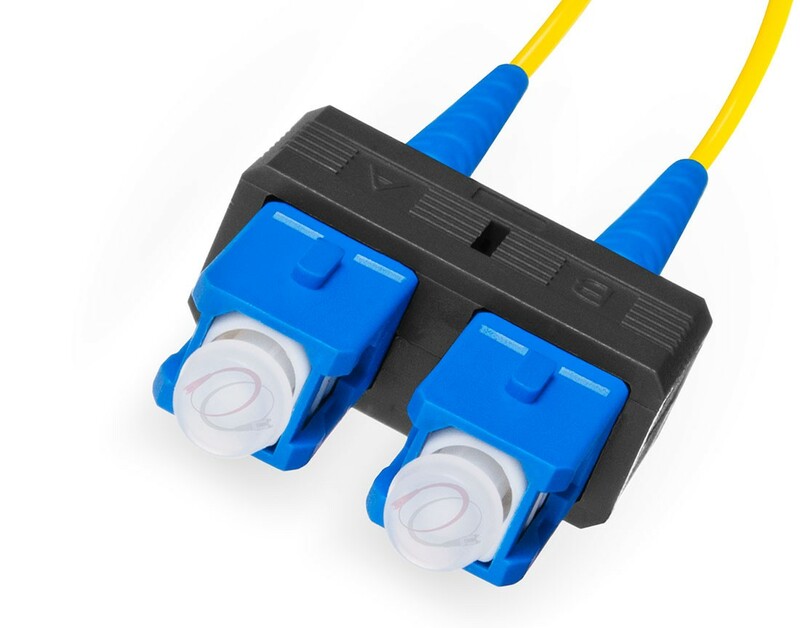 LC APC to SC UPC Duplex Fiber Patch Cable 9/125 Singlemode with Corning optical fiber. Terminated with durable, high quality, small 1.25mm form factor, ceramic ferrule LC APC (Angled Physical Contact) and 2.5mm ceramic ferrule SC UPC (Ultra Physical Contact) connectors (both with duplex clips). This single mode fiber (SMF) is designed for long distance 10GbE Ethernet fibre applications that require a high bandwidth fiber optic data transmission networking solution. 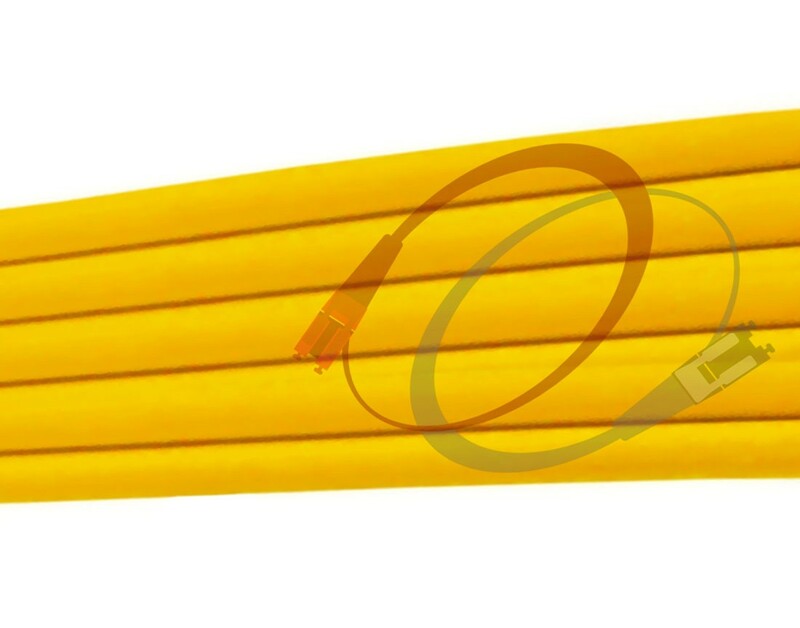 Yellow zip-cord fiber optic patch cable with 2.0mm outer diameter, OFNR riser rated PVC jacket that's, UV resistant and immune to electrical interference. Lengths available in our online catalog for Os2 lcapc Scupc 9/125 singlemode duplex: 0.5 Meter, 1 Meter, 2 Meter, 3 Meter, 4 Meter, 5 Meter, 6 Meter, 7 Meter, 8 Meter, 9 Meter, 10 Meter, 12 Meter, 15 Meter, 20 Meter, 25 Meter, 30 Meter, 35 Meter, 40 Meter, 45 Meter, 50 Meter, 55 Meter, 60 Meter, 65 Meter, 70 Meter, 75 Meter, 80 Meter, 85 Meter, 90 Meter, 95 Meter, 100 Meter, 125 Meter, 150 Meter, 200 Meter, 250 Meter, and 300 Meter. As always top quality product.